Place oats in large bowl, add milk; stir. Let stand 5 minutes. Heat electric nonstick griddle to 350°F or skillet over medium heat. For each pancake, pour about 1/4 cup batter onto griddle; spread to 4 inches in diameter. 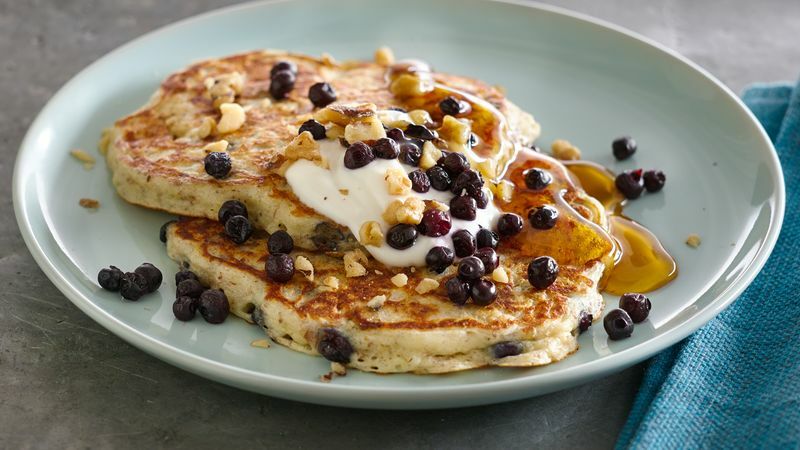 Sprinkle 1 tablespoon blueberries over each pancake. Cook about 2 minutes on each side or until golden brown and cooked through. Freeze leftover pancakes for a quick weekday breakfast. Cool pancakes completely on cooling rack. Place in resealable freezer plastic bag or container. If you don't have cooked quinoa on hand, these pancakes are great without it. Next time you are making quinoa, make a little extra to save for this recipe.